We&apos;re SO excited to be going to Children in Need Rocks at the Eventim Apollo, Hammersmith with Gary Barlow, Robbie Williams, Kings of Leon, Dizzee Rascal, Little Mix, Barry Manilow, The Wanted and many more! To find out more about the event and how to raise money for Children in Need, click here. We&apos;re delighted to be supporting the first ever #bekindtoyou Women&apos;s Wellness Week launched by Spabreaks.com. From 16th to 20th September, they will be exploring a number of aspects that affect women&apos;s wellbeing, from menopause to body confidence, as well as fundraising for cancer support charity, Look Good Feel Better. Not only that, four members of the Spabreaks.com team will be walking 100 miles from Bath to London in their dressing gowns to add to the fundraising efforts. Well done Ladies! To find out what&apos;s being planned for Women&apos;s Wellness Week, click here. We&apos;re very excited to be running a fantastic promotion again with our brilliant competition partners Spabreaks.com. 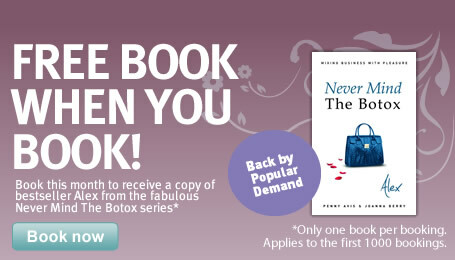 Get a free copy of Never Mind the Botox: Alex with every booking - valid for the first 1000 bookings made during the promotion period, which starts on 1 November 2012. To find out more click here. Spabreaks.com have been our competition partner since the launch of the series and we&apos;ve just started a very exciting programme with them that will see 1000 copies of our books being given away in our biggest promotion yet. Every person who books with them will receive a free copy of Never Mind the Botox: Alex, for the first 1000 bookings they take during the promotion period. For full details click here. In her role as Chair of Children in Need for the Northern Regions, Joanna attended a wonderful, star-studded, thank you party held by the Prime Minister and his wife at No 10 Downing Street. This year&apos;s Children in Need has raised a record £46 million to help disadvantaged children. What an amazing achievement. We are delighted to be attending the Children with Cancer Ball on Saturday 19th November at the Grosvenor House Hotel. We are giving away over 250 copies of Never Mind the Botox: Alex at the event, in goodie bags and as prizes for their lucky dip. It should be a great night! To find out more about the Ball click here. We will be doing a small number of pre-Christmas signings for Never Mind the Botox: Alex at Waterstone&apos;s. More dates will follow for the release of Never Mind the Botox: Rachel in January. Our twelve date Waterstone&apos;s tour for Never Mind the Botox: Alex came to an end this Saturday with Penny in Petersfield and Joanna in Doncaster and Derby. We&apos;ve loved every minute of the tour and later in the year we&apos;ll start planning for the launch of Rachel. Yesterday was &apos;shopping Centre Saturday&apos; for our Waterstone&apos;s book signing tour, with Joanna in Meadowhall and Penny in Lakeside. Both were jam-packed with shoppers and we had a great time chatting to them about the series and signing lots of copies of Alex. How exciting - our first ever book signing queue! A very big thank you to all those people who came to our Waterstone&apos;s signings in Wilmslow and the Trafford Centre this weekend - we are very grateful for your support. Next stop Putney and Oxford Street - scroll down for details. We had a fabulous time at Ladies Day, Royal Ascot courtesy of the lovely Abi, Director of Spabreaks.com. We backed Fame and Glory to win in the Gold Cup and it romped home! It must be a sign. Are we No 1 in the book charts? Well yes, but only for five minutes! We had a bit of fun putting ourselves at the No 1 spot while we were at Waterstones in Manchester for our signing on Saturday. Sure it will be us for real soon! Wilmslow and the Trafford Centre this Saturday. We are pleased to announce the following dates for our Waterstone&apos;s author signings for Never Mind the Botox: Alex. Signings showing at the same time are divided between us: Penny attending in the South, Joanna attending in the North. 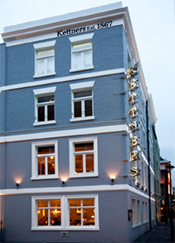 As part of the launch of Never Mind the Botox: Alex, we hosted another journalist lunch at Kettners Champagne Bar. A glass or two of champagne in the bar was followed by a lively lunch upstairs in the Salon Room. It was a beautiful sunny day and we were thoroughly entertained by the wide ranging discussion and great company. A big thank you to our guests for taking the time to come and meet us. GB40, otherwise known as Gary Barlow&apos;s 40th birthday concert, was held at the Shepherds Bush Empire for just him and 2000 of his closest friends. We were lucky enough to have tickets and what a concert it was! He played loads of the old classic Take That hits and was joined by the rest of the group (except Robbie, who appeared by video link starkers!) for a great rendition of Shine. Naturally we handed out a few copies of the Never Mind the Botox flyer to people in the queue, just in case. We had a fabulous night at the star-studded Galaxy National Book Awards ceremony held at BBC Television Centre. Highlights included being photographed on the OK! sofa, chatting to Andrew Marr about his award for Non-Fiction Book of the year and being first on the dance floor at the after show party! We hear that next year there will be a new award for Best Fiction Book about four women selling a cosmetic surgery business - it&apos;s got our name on it. "Intelligently observed and hugely entertaining"
"Plenty of glamour, pace and excitement"
"A perfect blend for a bestseller"
"Feisty, ambitious, stylish - a real page turner"
"Can&apos;t fault it - the perfect summer read"
© 2019 Penny Avis & Joanna Berry. All Rights Reserved.